Yesterday, the National Mall once again served its modern function as a national “stage” for topics of national importance as hundreds of thousands of marchers converged on the public open space in support of legal status for illegal immigrants. 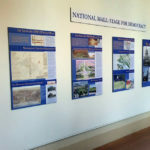 Our free Mall map, “The National Mall: Stage for Our Democracy,” tells the history in words and images of the Mall as place for history-making gatherings and events. You can read that history here (PDF, 388k). Visit also our “Great Moments on the Mall” feature, compiled in 2003 by students at George Washington University, that highlights some other historic gatherings and events.